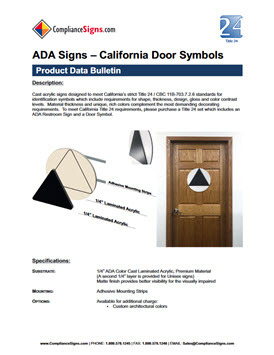 Cast acrylic signs are designed to meet strict California Title 24 / CBC 11B-703.7.2.6 standards. Meet Title 24 requirements for shape, thickness, design, gloss and color contrast levels. Material thickness and unique, rich colors complement the most demanding decorating requirements. Use the Download button to open this bulletin as a pdf file.